Today's images come from the Knott's Berry Farm Collection at the Orange County Archives, and show the first Knott's Halloween Haunt, in 1973. 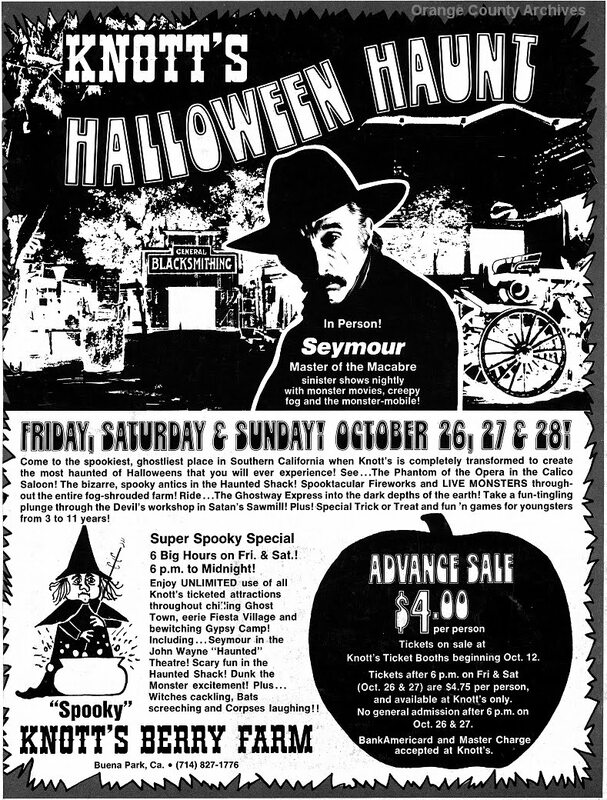 Note that the event ran for only three nights -- not an entire month, like today. Also note, in the photo below, the much shorter lines at the entrance gate. Today, the Haunt is a juggernaut and brings in much of the theme park's profits for the year. The majority of Knott's backstage warehouse space is filled with Haunt props and equipment, and a surprisingly large portion of the year is spent preparing for this lucrative event. 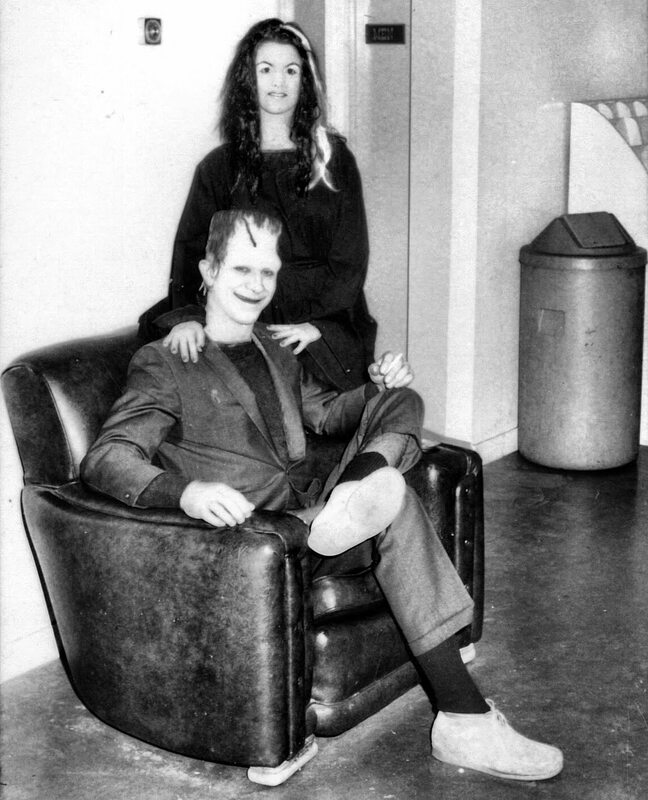 In the photo above, two of Knott's roving "monsters" take a break backstage. That's the least menacing Frankenstein's Monster I've ever seen. 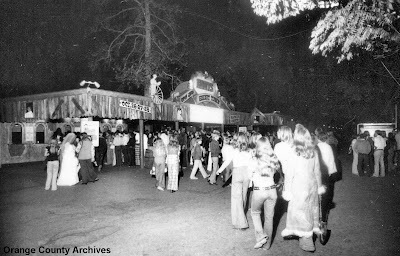 The Haunt has gotten a lot scarier over the years. 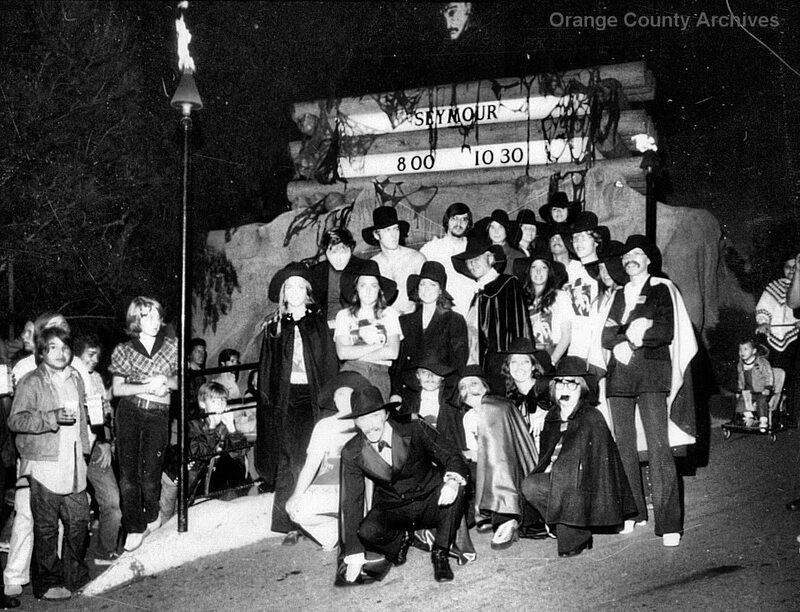 When the first Haunt was held, the new Gypsy Camp section of Knott's had just opened. It was a flop and didn't last long, but they made good use of it during the Halloween festivities. 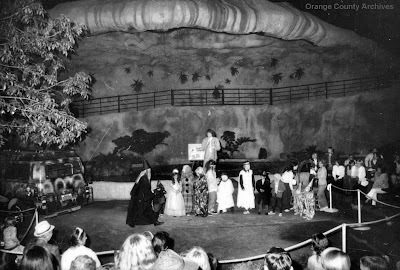 The photo below shows what appears to be a costume contest on a big outdoor stage in Gypsy Camp. 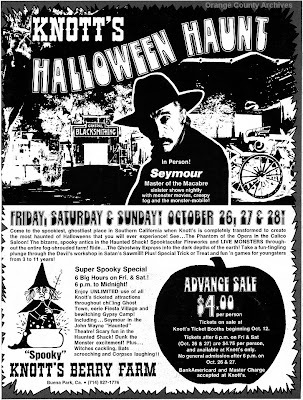 In the photo below, Haunt host Sinister Seymour (of local late-night TV fame) poses for a photo with participants in a Seymour look-alike contest. The group is standing in front of the newly opened John Wayne Theatre in Gypsy Camp. In case I don't get the chance to blog again this weekend,... Have a happy, spooky, kooky Halloween! "A circle of young people passed a very pleasant season in the G.A.R. Hall Wednesday evening in celebrating All Saints' day. The mysteries of 'ye olden time' were delved into by the young people in a pleasant and interesting manner and many were the happy surprises enjoyed by them all. At a late hour refreshements of tamales, coffee and sandwiches, furnished and prepared by the gentlemen, were served, after which toasts were responded to by Messers. E.B. Turner, Lon Hickox and John Nourse. It was the hour of midnight before the party, composed of the following ladies and gentlemen, departed for their homes:Misses Conley, Collins, Clara and Grace Carpenter, Flook, Mansur, Padgam, Stone, Walker, Clara and Maye Wight and Messrs. Heron, Caskey, Gould, Nourse, Chilton, Hasel, Hervey, Turner, Hickox, McIntier, Bell and Carpenter." So,... They celebrated Halloween by eating Mexican food and staying up late talking about history. I'm a little annoyed that I didn't get to attend! 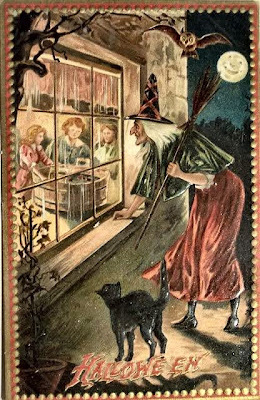 "It is the night of all others, when spirits walk abroad, and is observe with an immense consumption of nuts and apples. The apples were once set floating in a tub of water, into which the juveniles by turn ducked their heads in order to catch one of the fruit." Today's "then and now" photos, from 1961 (above) and 2010 (below) come from Ken Stack of OutsideTheBerm. They show the site of the First National Bank of Yorba Linda. 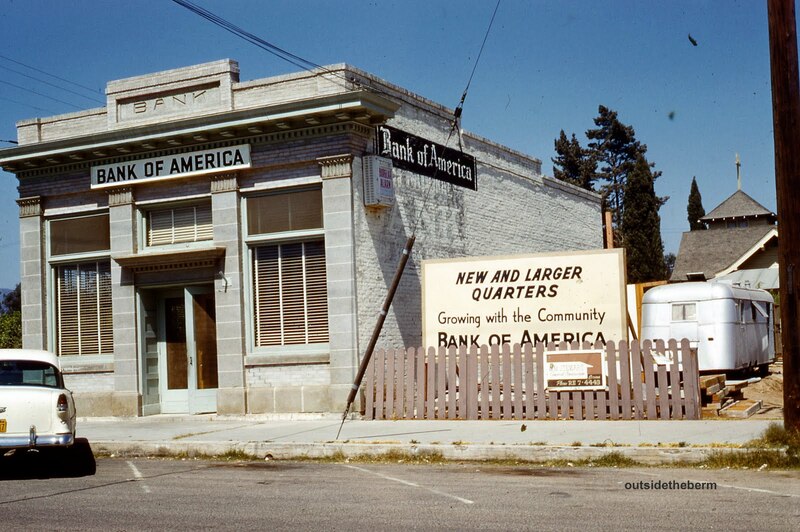 The building became a Bank of America branch in 1945, but is now just another historic parking lot. 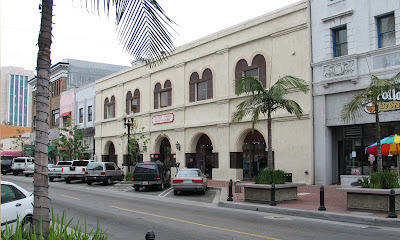 "That's the old First National Bank of Yorba Linda building. Not sure when it was built, but it was probably around 1916, when the bank opened for business. 'Another development worthy of note was a promotion of a bank which was undertaken by J.W. Hargrove, a former resident of Minot, South Dakota, where he had been in the banking business. Mr. Hargrove had some $25,000 capital and secured the balance by sale of stock at $100 per share. 'I was asked to buy five shares as a civic duty, but I turned the offer down on plea that I didn't have the money and for the further reason that I considered I could use the money for quicker turn over and bigger profits in private business. 'However upon insistence of an Anaheim banker who offered to loan me the money for that purpose, I did buy five shares to enable Hargrove to qualify for a permit. I sold the stock after a few months later at par and paid back the money. 'Looking back I can congratulate myself that I did not retain the stock. It never did pay very well, and went under in the crash of '29 losing the stockholders quite a bit. Even depositors lost money." "John W. Hargrove served as president of the bank from its founding until his death in 1931 at the age of 68. The bank survived him by less than three months, closing its doors in January, 1932 (one of a number of smaller Orange County banks to go under during the Depression). "Yorba Linda did not have a bank again until the Bank of America opened their branch in the old building in 1945. As the sign next door indicates, they built their new office next door in 1961. I do not have the date handy when the only building went down, but I suppose it was not long after." The 110-acre antenna farm at what's now Santa Ana's Centennial Park was officially known as the Santa Ana Primary Monitoring Station. It was built by the federal government in 1941 to listen to signals being sent from Hamburg, Germany (6,000 miles away) to Hitler's spies in the U.S. Thirty three spies were arrested based on this program. By the early 1950s, it was operating as one of eight Federal Communications Commission monitoring stations, scattered across the country. Thirteen people worked there in shifts, around the clock. They made sure FCC regulations were being adhered to in our area. But in addition to playing "radio traffic cop," the facility was also recording broadcasts from Russia and other parts of the world. At the time of a 1952 L.A. Times article about the facility, William J. Hoffert was the engineer in charge and Alfred K. Robinson was the assistant engineer. They couldn't talk about their spy activities, but they said they'd "brought to justice operators of illegal portable radios in local race tracks, located lost planes, and prevented the burning of at least one yacht." "During World War II, a phyiotherapy outfit in a medical building was found to be doubling as an illicit radio transmitter. Special cunning was required to discover that a clarinet player in a Berlin orchestra broadcasting to this country was varying his tempo to send messages to German agents in America. "What seemingly is pesky static on a broadcast from England may be something else. What is there to keep a foreign enemy from making recordings of static and broadcasting them on the British program wave length? 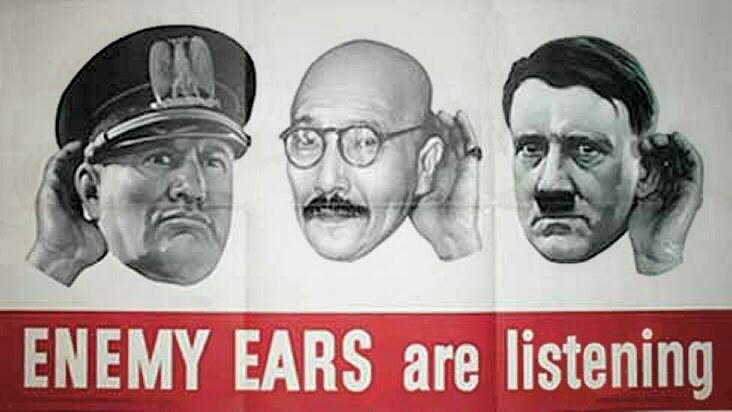 A Churchill speech might even be used to camoflage coded signals from Stalin." Brad Weber tipped me off to this article and also told me, "I knew people -- civilians -- who were prominent in the communications and radio field and were allowed to visit the facility prior to the 1950s." "One time we decided to take out pellet guns out to the river and hunt mice and rats. We parked our bikes at the bottom of the dip in the sand and proceeded to walk west down the river to see what we could find. This placed us parallel with the antennas. Then, suddenly, we were confronted with a couple of men with guns and badges, and were told that we were not to be in that area, and that it would be best if we left. They said they were government guards, not police, and we would not be reported if we didn't return. We never did." Reader Jim B. related a similar experience from the 1960s, when "a couple of my friends went up to the gate one day to see if they could take a tour but were told (not in friendly terms either) to leave." Rich S. wrote that he was told the FCC facility was heavily guarded due to the "threat of war [with the USSR] and possibility of communications takeovers." Orange County Historical Commission Chairman Don Dobmeier also stopped by and said that local historian Wayne Gibson once told him the Santa Ana monitoring station was "where the Japanese code was broken" during WWII. At some point, I may need to call Mr. Gibson and see if he can tell me more about that particular story. Here's a interesting object in Bowers Museum's current "Weird & Wonderful" exhibit. It's a breadfruit pounder -- just like the ones used in Tahiti and other parts of the South Pacific and Southeast Asia. However, this particular implement was found in 1903 in the bottom of the Santa Ana River near Huntington Beach. How did it get from one place to the other? While I may quibble with a few of this exhibit's descriptive panels, it's all definitely worth seeing. It's a gathering of random bits and pieces from the museum's various collections, including their Orange County artifacts. See it before it closes on Nov. 14. Author and architectural historian Alan Hess will speak on the subject of Orange County Modernism on Wednesday's meeting of the Old Courthouse Museum Society. The meeting will begin at 11:45 a.m. in the upstairs gallery at the Old Courthouse. (RSVP to Rebecca at the museum if you want lunch.) Alan is always an interesting and popular speaker. 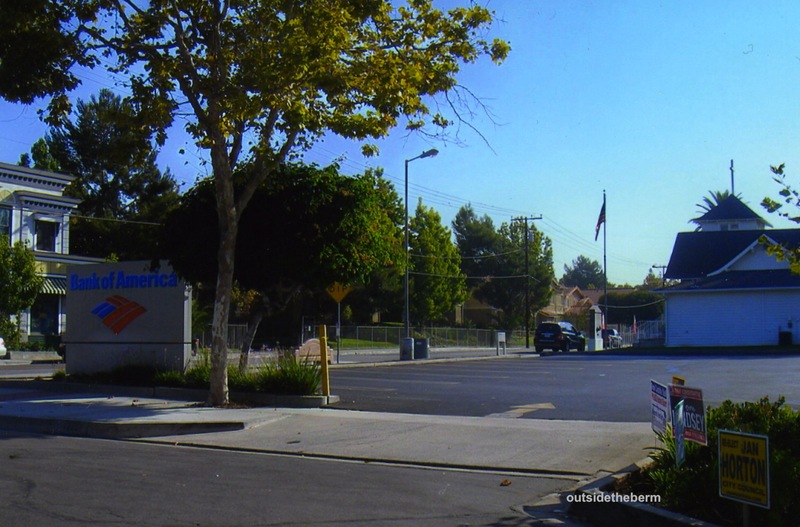 Doug M. recently wrote with an interesting query: "I have often wondered what the government installation was at the southwest corner of Edinger Ave. and Fairview St. [many years ago] ...I remember seeing large 'No Trespassing, Government Property," signs. The property is developed now and nothing remains of the white, large, two-story, woodframe structure that once stood in the middle of the field. Was it a listening post, agricultural research, etc...?" Today, the site in question is part of Santa Ana and has become Centennial Park, Hector Godinez High School, and the Heritage Museum of Orange County. Newspapers and the web turned up very little information on the site's history, so I dug into the historical aerial photos. 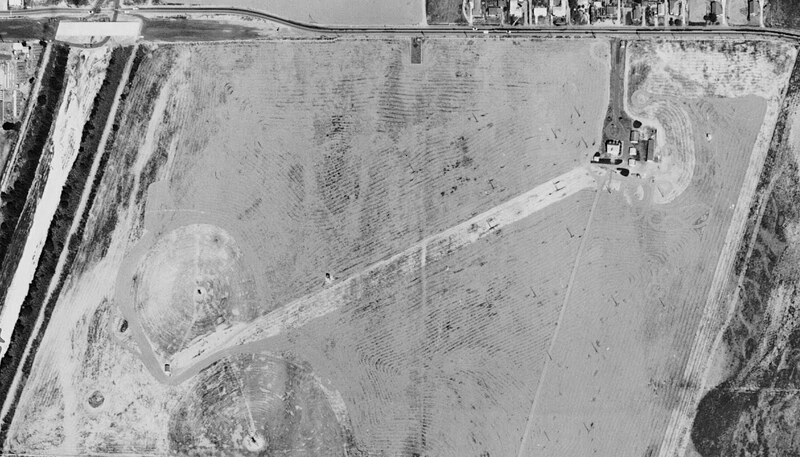 The 1959 image of the site, shown above, is probably the most interesting. (Click to enlarge.) 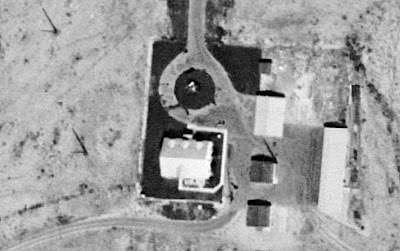 At first, it appears to be a farm house with a circular driveway, surrounded by open fields. But curiously, the fields appear to be fallow in most years. Even more curiously, closer inspection reveals a rather large array of antennas spread across the property. 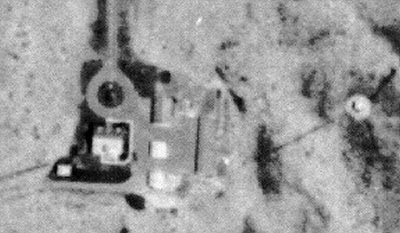 The 1955 aerial (detail shown below), shows a white, circular object to the east of the "farmhouse," It looks a bit like those radar installations that dotted Orange County during the Cold War. Next, I contacted Greg Rankin, President of the Orange County Historical Society and Principal of Godinez High School. He didn't know anything about it, but forwarded my query to my old pal Adam England at the aforementioned Heritage Museum of Orange County. Adam wrote, "I have some info on the Centennial Park land I’ve gleaned through numerous interviews with various founders of this museum as well as my own research. ...On June 9, 1941, the United States Government acquired the land from W.F. and Marine M. Croddy. "...The property was used during WWII for 'spy training', the antennas on the picture were 300’ relay towers, during the Cold war, utilized for missile guidance. The farm house was a two story affair, made of thick cement, with three additional stories underground, used by government for unknown purposes. Paul Reardon, one of the early founders of [our] museum, wanted to put his office there but was refused. Individual farmers were allowed to farm the land, and the Santa Ana Unified School District was permitted to park equipment there. "It was owned by the government until June 15, 1967 when it was donated to the Santa Ana Unified School District. The remaining 99 acres were given to form Centennial Park and [an annex of] Santa Ana College sometime after this period. "SAUSD put Mitchell School on the grounds, but the rest sat unused. They were informed they would lose the land if they didn’t do anything with it of an educational nature. That was when the Exploratory Learning Center, [now the Heritage Museum of Orange County,] was formed around 1980." It just goes to show that you never know what historic sites may be right in your own backyard. Architect Richard Neutra (1892-1970) is among the best known and most influential American architects of the mid-twentieth century. The Orange County Historical Society will gather this Saturday, 2pm-4pm, at the Old Orange County Courthouse, 211 W. Santa Ana Blvd., Santa Ana, to hear a panel discussion about Neutra and 20 of his architectural works throughout Orange County. Panelists include Neutra’s son, Dion Neutra, (an important architect in his own right), noted architectural historian and author Alan Hess, art and architectural historian Daniel Paul of the L.A. Conservancy's Modern Committee, architect and preservationist John Linnert, and designer/artist Craig Sibley. The meeting will be held in conjunction with the opening of the “Amazing Neutras in Orange County” exhibit at the Old Courthouse Museum. Many of these images and artifacts were displayed earlier, at the Objct Gallery, in Claremont – But you’ll find at least a few cool new things to see (collected by the Orange County Archives) here at the exhibit in Santa Ana. The parking lot directly behind the Courthouse (off Civic Center Dr.) will be free that day, as will the County Lot at Ross St. and Sycamore, behind the County Hall of Administration. There are also a number of downtown pay lots within easy walking distance. The architecture of Richard Neutra reflects the prosperity and optimism of postwar Southern California. As evidenced by his designs for private residences, churches and governmental buildings, Neutra’s buildings are characterized by geometric precision, airiness, and simple dignity. Though many of these buildings have been recognized for their historic and design significance, some of Neutra’s masterpieces in Orange County face uncertain futures. This program and exhibit will examine some of Neutra’s best work and will hopefully bring attention to their preservation status. 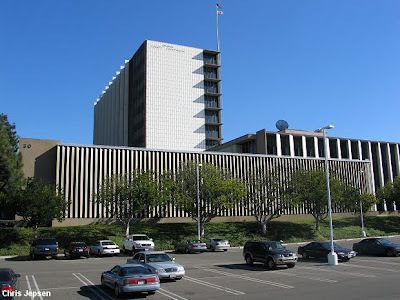 Examples of Richard Neutra’s buildings in Orange County include the Central Justice Center in Santa Ana, (shown immediately above), the Garden Grove Community Church (a.k.a. Robert Schuller’s “Drive-In Church”), the Mariner’s Medical Arts Building in Newport Beach, and portions of Orange Coast College. Dion Neutra’s Orange County projects include the Huntington Beach Central Library (model and blueprint shown at the top of today’s post), and the Prayer Tower at the Garden Grove Community Church. We recently learned that the Claim Jumper restaurant chain filed for bankruptcy and is changing ownership. The ensuing news coverage reminded me that Claim Jumper -- like Marie Callender's, Coco's, Polly's Pies and other chains -- was started right here in Orange County. On Sept. 27, 1977, father and son business partners Carl and Craig Nickoloff opened the first Claim Jumper restaurant in Los Alamitos. (Seen in the photo above.) The 250-seat restaurant became known for its good food and large portions. In a 1999 interview with Nation's Restaurant News, Craig Nickoloff remembered, "We were wrapped, set and ready to go for about $250,000. Those are fees to a city today for a sewer hook up." The business' California Gold Rush theme was chosen by the Nickoloffs, who enjoyed Western movies. As they brainstormed, they kept coming back to the name "Claim Jumper." Never originally envisioned as a chain, Claim Jumper's popularity and Craig Nickoloff's love of a challenge led to the opening of a second restaurant, then a third, ...and so on. The first four restaurants were all in Orange County, and were built on the bones of older restaurant buildings. The fifth was opened in the City of Industry and was the first one built specifically as a Claim Jumper. Currently, there are 45 locations spread across the Western and Midwestern United States. Interestingly, Craig Nickoloff is a third generation Southern California restaurateur. His grandfather, Nicholas Nickoloff, a Bulgarian immigrant, started Nik's Coffee Shop in Long Beach in 1957. Carl, the second generation, ran Nik's for 25 years, and Craig got his start there washing dishes in 1963. 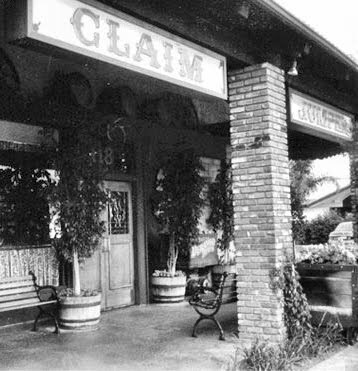 The original Los Alamitos Claim Jumper closed its doors in the 1990s. The threshold of the restaurant, however, was removed and attached to a Claim Jumper in Long Beach. 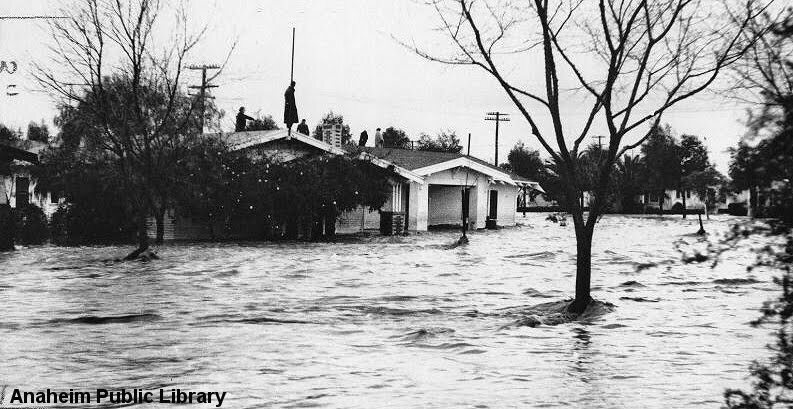 Today's photo shows people standing on the roof of their Anaheim home during the flood of March 1938. This flood inundated much of Orange County, leaving death and destruction in its wake. The Anaheim and Placentia areas were directly in the path of the raging waters, with the small town of La Jolla being hit the hardest. "My dad and his family lived in the Mexican colony of La Jolla during the 1938 O.C. flood. The school principal, Mr. Whitten, at La Jolla School (later renamed McFadden School and today Melrose), is responsible for saving many of their lives. After the storm, the people of La Jolla collected coins and purchased a wristwatch to show their gratitude to their local hero, Mr. Whitten." "Chester Whitten, head of La Jolla School, is just about the best-like principal in the State of California, and there is good reason. 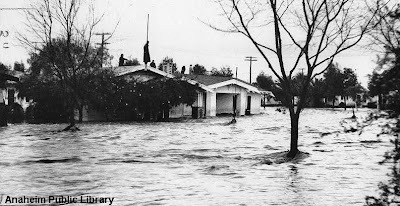 In the flood of March, 1938, he rounded up all the Mexican residents fo the area and got them into the primary school building as the water was rising. When the crest of the flood hit at 3 a.m., there was a foot of water in the building and his charges had to climb on tables and chairs -- but if they had been home they would have been drowned..."
Chester I. Whitten was born Feb. 1, 1903, in Kansas. He was still living in Placentia when he died at age 92 in 1995. I believe an interview was recorded with him for CSUF's Center For Oral & Public History. My thanks to Anonymous for putting him back on our radar screens. 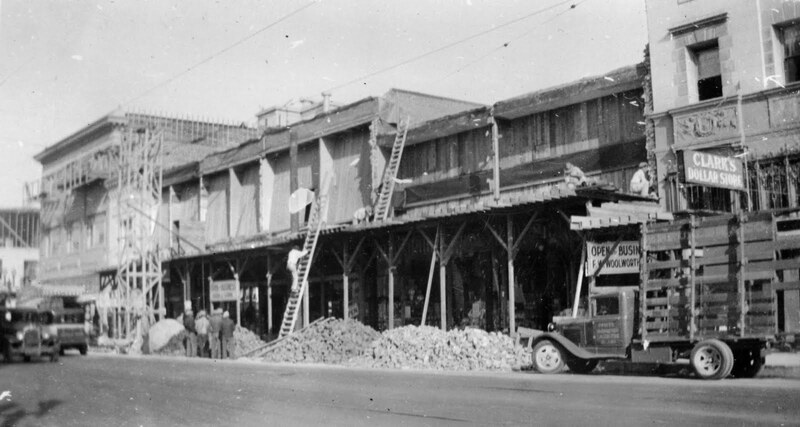 ...just after the 1933 earthquake, and again (from the same angle) more recently. The building in the center, which lost its entire facade, was the Woolworths. Later, the store moved to a location that's barely visible on the left side of the image. The building on the right, with the fancy griffin motif under the window, is the Otis Building. 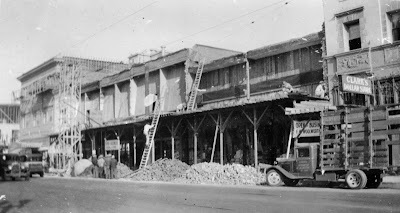 It's had some major changes to it over the years, which is obvious when you look at early photos of Downtown Santa Ana. Don't forget that the Dana Point Historical Society's annual home tour is this weekend.